Legislation that would make Washington’s presidential primary usable by both major political parties for the first time in state history cleared the Legislature today with an almost party-line vote in the House of Representatives. Engrossed Senate Bill 5273, sponsored by Senator Sam Hunt, passed with a vote of fifty-four to forty-two, with two excused. The bill moves the the default date of the presidential primary from the fourth Tuesday in May to the second Tuesday in March and puts the political parties in charge of drawing up the list of candidates that will appear on their respective ballots (instead of the Secretary of State). Brian Blake was the only Democratic State Representative to vote against the bill. No Republicans voted for it, perhaps desiring to show solidarity with Secretary of State Kim Wyman, who wanted a bill that would have mandated the inclusion of a meaningless “straw poll” ballot” — a dealbreaker for the Democratic Party. In past presidential cycles, Washington State Democrats have exclusively used caucuses to allocate and select their national convention delegates. The party is now considering incorporating a presidential primary into its Delegate Selection and Affirmative Action Plan (DSAAP) for the first time ever. If the party’s State Central Committee (WSDCC) chooses a primary-caucus hybrid approach instead of an a party-run caucus only approach, then caucuses would be retained for delegate selection purposes, but the primary would be used to allocate delegates to each candidate. A draft 2020 DSAAP is due to be published this week by the state party, kicking off a thirty day public comment period. In addition to moving up the default date and removing the Secretary of State’s role in deciding which candidates appear, ESB 5273 allows the parties to request the inclusion of an “Uncommitted” option on their ballots if they so desire. Republicans have used the primary (when held) to allocate some of their delegates. In 2016, they allocated their entire delegation based on the primary results. Supporters of ESB 5273 believe an earlier date will ultimately give Washington more influence over who is nominated… and give people a reason to turn out. Hunt argues that a primary would be more inclusive, as caucuses are often inaccessible to those who work on Saturdays or cannot find childcare, as well as military personnel serving overseas and people working or traveling abroad. ESB 5273 previously passed out of the Senate with bipartisan support and is supported by both of the state’s major political parties. The Democratic Party made adoption of a presidential primary reform bill that respects its First Amendment right of free assembly one of its legislative action priorities for 2019 last September at its meeting in Spokane. ESB 5273 now goes to Governor Jay Inslee, who last Friday announced his candidacy for the Democratic nomination for President. If signed into law, Washington will join California, Texas, Massachusetts, Alabama and seven other states holding nominating events in the first weeks of March. The state retains the flexibility to change the primary date if agreed upon by a bipartisan commission including the leaders of the major parties, the state’s legislative leaders, and the Secretary of State, currently Kim Wyman. 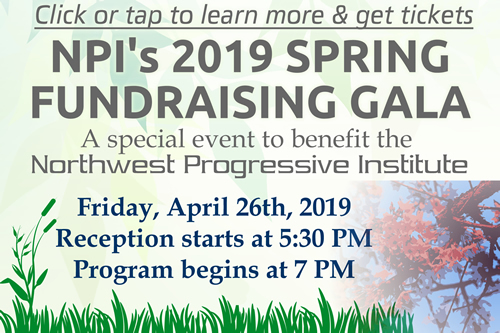 Washington State Democrats will make a final decision on whether to utilize a presidential primary for 2020 on April 7th when the WSDCC (which NPI’s Andrew Villeneuve is a member of) gathers in Pasco for its spring meeting. Sweet! This sounds like a very promising development. Column in Wednesday Seattle Times by Danny Westneat takes on the bill for allowing the parties to obtain mailing lists from the primary.